The old house was broken. Most of its frame was falling in, unable to hold up its own weight. What once had stood tall was now crushed in, its boards bent over the flooring with only some concrete blocks as a foundation. It is easy to look upon structures like these and recognize immediately that they are in a state of ruin. What’s not so easy is to look upon your family, your friends, your neighbors—-even people on a crowded street—and recognize the broken and crushed condition of their hearts. Many people live in silent pain, hiding their brokenness at all cost. Ashamed, they try to bear their burdens alone. There is hope for them, but they don’t know how to find it. Restoration is possible with God. Is there someone you know today who needs to hear this truth? 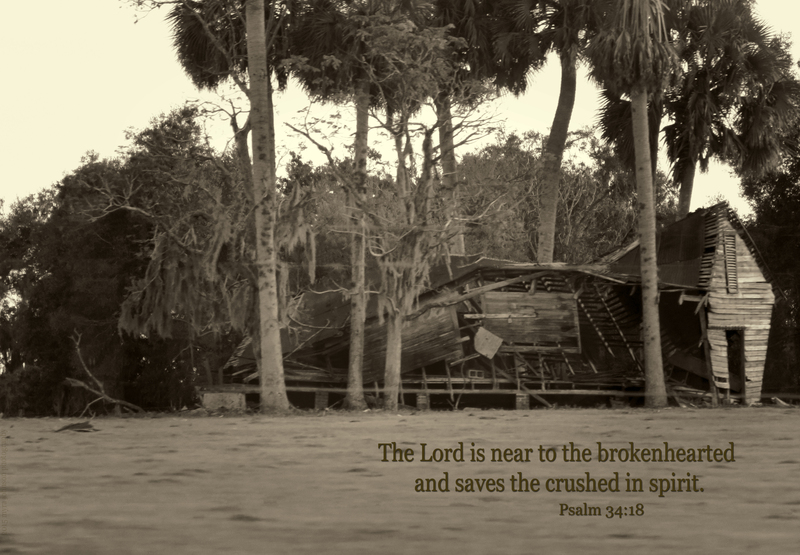 This entry was posted in Christian Devotions, Inspirational photography, photography, Photos with Christian thoughts by Myra Johnson, Spirituality and tagged brokenhearted, burdened, crushed, old house, Psalm 34:18, sad.